The price tag for NASA’s next big space telescope keeps rising and the launch date will likely be delayed as well. 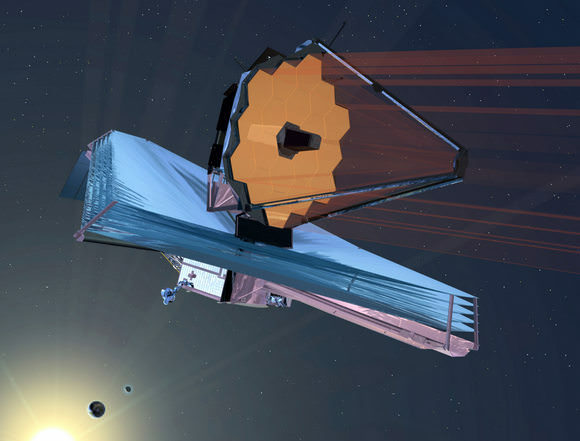 A new report from an independent panel on the James Webb Space Telescope reveals it will take about $6.5 billion to launch and run the telescope for its projected 10-year mission. The price had previously ballooned from $3.5 billion to $5 billion. Originally the telescope was slated to launch in 2007, but was pushed back to 2014. Now, the panel says, the earliest launch date would be in September 2015. The panel, requested by Congress, said there appears to be no technical issues with the telescope, but budget and management problems are the reasons for the cost overruns and delays. The money to cover the overruns will require $250 million more in NASA’s FY 2011 and 2012 budget. But with the current state of affairs in the country and Congress, it is likely other programs will suffer or be cut in order to pay for JWST. In a teleconference with reporters, NASA associate administrator Chris Scolese admitted that NASA officials did not do a very good job of keeping track of what was going on with the massive telescope project. The panel concluded that the budget was not sufficient in the early days of the telescope’s development for everything to go as hoped. “This is a large, complex project and to estimate something to a real degree of precision is hard,” Klineberg added. The panel found no way for current costs to be reduced, but found ways to reduce the likelihood of cost-growth in the future. In order for JWST to be built and launched, the panel said NASA should restructure the project organization at Goddard Spaceflight Center to improve the accounting of costs and reserves. The program will now report directly to the Administrator’s office. Richard Howard will be the new JWST program director, replacing Phil Sabelhaus. The teleconference with journalists included a first – at least for this reporter: one caller berated NASA management and swore at Scolese, obviously frustrated by the lack of oversight by NASA on what is supposed to be a flagship mission for the space agency’s astronomy division. The infrared telescope will have a 6.5 meter (22 ft.) mirror and a sunshade the size of a tennis court. JWST should be able to look back in time to find the first galaxies that formed in the early Universe, and to peer inside dust clouds where stars and planetary systems are forming. It was responsible for the restricted decadal astronomy plan, and it is *still* running over plan!? Ouch! Heh. Wonder it it is the “I’m-not-really-in-your-face-because-we-aren’t-in-the-same-room” web effect? Btw, I had some trouble deciphering that particular sentence (I’m only on my first coffee). Maybe “one caller” would have made it easier. as usual. too much bureaucracy. We spend $190 million a day in Afghanistan. Studying the Universe in which we live (and of which we are made) is not only the most important enterprise when it comes to investment but also, when compared with our yearly military budget, it remains a mere tiny fraction. Designing, constructing, launching, and operating these telescopes should be enacted from a far greater budget. Imagine the insight learned, and imagine the discoveries that could lead to unforeseen, real-world applications. But, we live in a scientifically illiterate country within an (overall) scientifically illiterate world. One can sense the coming tragedy. Moreover, in a private company it is very unlikely to get approval for extra budget (unless the project is critical/strategic for the company) and certainly not at the budget overruns that NASA has in some projects (from 3 to 5 B and now 6.5! more than double from the initial estimation). Even NASA itself does not allow its commercial suppliers to have such cost overruns (I am referring here to commercial suppliers with capital C, not Boeing, Lockheed & Co). In 2007 they terminated their contract with Rocketplane Klister for “not meeting financial milestones”. I’m going to love the science coming out of this when it finally does. I’m also going to hate it if it turns out to be at the expense of some unmanned mission out there, again. So they can’t work a budget. They can be off by nearly 100% on estimates but we should trust their judgments on everything else? Things like this make the scientists look either stupid or corrupt. In fact, it makes them look no better than the military contractors. Wait, this work is being done by a military contractor. Why would they poor so much money into a military contractor with experience at bulding black projects. Why would they poor so much money into a military contractor to build a “telescope”. Right after a series of space missions where we performed close flybys and actual collisions into space objects like comets. If someone knew there was a very high likelyhood of a rouge space object colliding with the Earth is this the way they would hide the program from public eyes until it had to be made public? I like the Hubble photos too but at this point with our econmy in ruins projects like this make it look more like we are the guy running out to by the big screen before filing bankrupsy. The contracting procedure for NASA programs is virtually identical to DOD. In a nutshell a program is often awarded to the lowest bidder, who then later incurs cost overruns and the budget grows. This is almost universally the case, where with some programs costs can multiply up to 10 times. As it is pointed out we spend a JWT cost equivalent on about a bi-weekly basis in Afghanistan. So it is not as if JWT is a deficit budget buster program. However, war is serious business American’s really love, while astronomy is seen as a form of recreation. Anyone who hires any sort of contractor knows that budgets tend to increase, and often unexpectedly. The creation of space telescopes, which are unprecedented with every iteration, will always have unforeseeable costs. So when you look at the complexity and the difficulty of an instrument like the JWT, cost-hikes I think are both reasonable and unsurprising. And the very nature of a *proposed* budget leaves open the possibility of change. Should NASA craft better assessments and more accurate budgets? Of course. But let’s not forget that once these tools are created and operating, they produce tremendously. And reducing the output of the HST to mere pretty pictures is missing the point. Those images contain enormous amounts of information to the trained eye, and also supply insight to a species whose forays into science remain only several centuries old. Humanity will always have problems. Diminishing investment in space exploration in light of these problems is simply and utterly myopic. Like it or not, we exist in a physical Universe. And if we choose not to study and not to learn about our environment, we humans will only add to the risk of extinction. We gave $700 billion to the banks and agencies which caused the global downturn. I think providing less than $10 billion for a revolutionary space telescope is a much better investment. Anyone here remember the design and construction phase of the Hubble Space Telescope? Repeatedly behind schedule and over budget. This is just the 21st Century manifestation of these problems. No, anyone “who are incompetent” who hires any sort of contractors knows that budget tend increase. Its all politics you know. The decision is made by feel good stories and by management who cant even read engineering drawing! Low ball it, and government will keep on paying like an idiot. People who run these program get “promoted” for bring in more money! Congress should demand firing of all decision maker on the spot for incompetence and never to be doing business with Government again. They wont, and I wander why? Its all politics you know. Remember toughtoenails, NASA is not run by scientist and engineers, but by bureaucrats…. Some suggestions to increase money for JWST: cut all “earth science” missions. I don’t know how many missions there are studying “global warming”, CO2 levels, melting ice, et.al (ad naseaum). This would help NASA to do real science. Hi guys, I cant really add much more as there has been some really relevant posts. Its good to see fellow passion and dedication here, some of which I could see Carl Sagan himself writing. Money is in proportion to public interest and until public interest increases $6 billion is going to sound a lot of money. At least this beautiful project made it this far. Good luck to everyone involved, keep up the good work. Instead of having everyone wanting their specs and added chrome and more chroming by so many because so many have ‘overblown egos’ , NASA should’ve just blast the ‘scope into orbit as orginally planned and the hell with those people with ‘ overblown egos’!!!!! What a waste!!!!!!!! In 2007 they terminated their contract with Rocketplane Klister [sic] for “not meeting financial milestones”. That is actually another sign of mismanagement from NASA. Rocketplane Kistler never delivered *anything* what I know of. (And I believe that this was it’s reputation, and why it failed to secure the needed non-NASA funds.) It was an air castle company, to all appearances. When it went belly up this year, according to Wikipee, it had ~ 0.1 MUSD as assets, and ~ 10 MUSD in liabilities. 1962: Federal German airforce official. “Development costs? But surely you can’t forcast development costs? Lockheed salesman: Just sign here Herr minister and rememeber – G for Germany. G for Germany. From ‘Captain Lockheed & The Starfighters’ by Robert Calvert 1974. For an essential telescope project like the John WEBB, it should first be built, before determining how much money is actually spent! They waste far more money on worthless jobs they want to self justify existances for promotions and bonuses,, by finding ways to save money when they actually lose money, such as how much is going to cost, and how can we screw things up by doing it our way instead of the way of the workers. If, as has been said, we really do have the plans to make a Saturn V rocket, and if we don’t dork with the design by using new materials, it seems we should be able to build one, build an 8 meter telescope, and launch for less than $3.5 billion. It would be a much simpler single mirror design. A more complicated seven mirror design like the Web might be 24 meters.